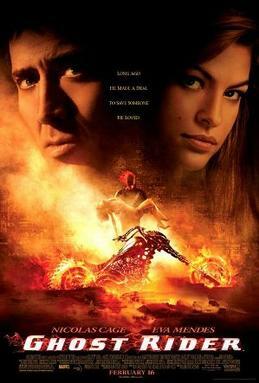 Yesterday I watched Ghost Rider (es: El Motorista Fantasma) (IMDb|FilmAffinity). I have to say it is not a very remarkable movie, in any sense. The plot and script are nowhere to be seen, and the action could be better. However, the special effects are nice, and the photography is decent. Eva Mendes is also a factor to take into account. Watch it only if there's no other better movie in the theater, and you could use a couple of ours of a mean-looking, heavy metal-style, burning skull-headed, black leather-clad, tormented-soul badass hero, doing little more than riding a fast motorcycle. This entry was posted in Entertainment and humor and tagged en, movies by isilanes. Bookmark the permalink.